GAby Menta » Do you have an online marketing Strategy ? Does your business have an online marketing strategy? 1. No-specific online marketing plan. 2. Separate online plan defining transformation needed and making case for investment. 3. Integrated online plan which is part of marketing plan – digital becomes part of business as usual. 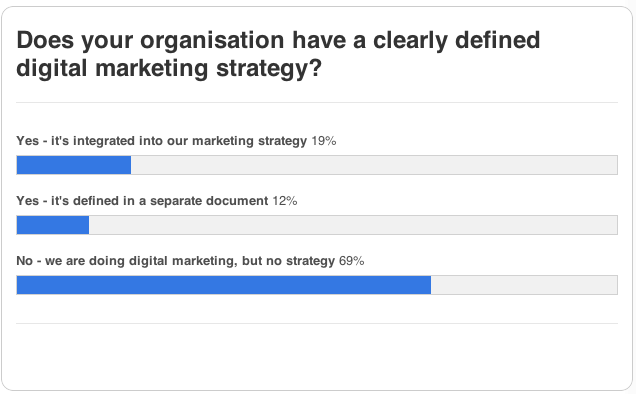 Does it surprise you that the majority of businesses we polled don’t have a plan for incorporating digital marketing? I don’t think it is surprising when many marketers seem to be obsessed with the tactics – it’s just another symptom of bad marketing. First, let’s applaud the many that do. I split these into two in the poll since I find the creation of digital plans often occurs in two stages. First, a distinct digital marketing plan is created. This is useful to get agreement and buy-in across the company since it should show the opportunities and problems of digital and map out a path through setting goals and specific strategies for digital including how you integrated digital marketing into other business activities. Those who responded that they have digital integrated into their marketing strategy are likely more advanced – this is where every company should be headed I think. Here online marketing is a core activity—it’s “business-as- usual”, but doesn’t warrant separate planning, except for the tactics. What about those who don’t have a strategy, but are still using online marketing? We can’t dismiss these guys since they are the majority. There may be different reasons – these are all very valid reasons I hear. 1. Not another ****ing plan! If you work for a large company, it’s likely you already have more than enough strategies and plans in place. In a smaller company, there is no time to create one. But in both places there will generally be an overall marketing plan or strategy, even if its in someone’s head, although that sounds dangerous. 2. A separate digital plan can give problems of integration and ownership. As I mentioned above, the ideal approach is to create a digital plan to help set goals online goals, make the business case for investment, and create a long-term roadmap. But once you’re are on this journey the long-term ambition should be to integrate digital marketing seamlessly into your marketing or business plan. 3. Digital technologies and marketing strategies change fast. They certainly do. At this time last year, we didn’t have Vine, Instagram Video, Google’s Hummingbird or Twitter’s IPO (and the list goes on). There are certainly great opportunities for the savvy companies that test new tech and get an edge before others adopt it. But at the same time you can get distracted from the fundamentals like search, content and email marketing which will probably drive more business than the latest “shiny objects”. But that said, there are many other reasons why a digital strategy makes a lot of sense such as, intake of breath… a lack of clear goals and tracking, poor differentiating brand proposition compared to competitors, untargeted ads, limited integration, emails or sites that don’t deliver relevance… I could go on… here are 10 reasons you could need an online strategy. So, there are plenty of logical reasons why a planned approach to online marketing will help you focus on growing your online business.